There is perhaps no better way to celebrate Israel’s landmark 65th birthday this year than by joining 3,000 like-minded Jews from across the globe in Jerusalem, and meet with Israelis from across the political spectrum to discuss issues facing Israel and the global Jewish community at this year’s General Assembly, aboard UJA of Greater Toronto’s General Assembly Mission to Israel. 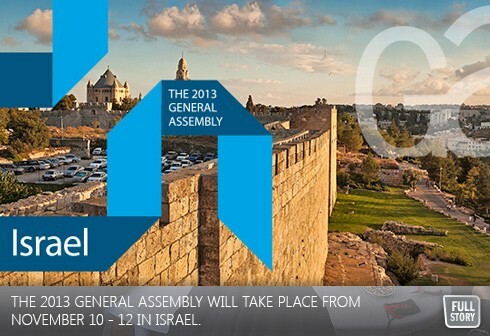 The “GA” - an annual gathering held in Diaspora cities – moves to the Jewish state this year, making an incredible experience even more remarkable, and, by participating as part of UJA’s exciting and unique mission, participants will be treated to an unforgettable week. In addition to attending the GA, UJA mission participants will also have the pleasure of spending three days in Tel Aviv and enjoy a unique Shabbat experience. Being part of any UJA mission has its privileges, and the GA Mission is no exception as participants will take part in exclusive briefings with some of Israel’s leading politicians, journalists and philanthropists while enjoying luxury accommodations at Tel Aviv’s Carlton Hotel and the David Citadel Hotel in Jerusalem. Mission participants will attend a special performance by the Israel Philharmonic Orchestra, and travel to UJA Federation’s partnership region, the picturesque resort city of Eilat where they will have the opportunity – firsthand – to see how their UJA support has transformed this vital and flourishing region, located on Israel’s southernmost tip. Register for the Mission and the GA by September 16th and receive $200 off the GA Conference registration fee! To register or for more information, please contact Eyal Golan 416.635.2883 EXT. 5136 or at egolan@ujafed.org.